The historic 1732 Pratt House welcomes visitors for Connecticut Open House Day, June 10, 2017. Photo courtesy of Essex Historical Society. ESSEX — Essex Historical Society (EHS) shines the spotlight on its historic structures in 2017, focusing its energies on setting the stage for a friendlier, community-centric approach to sharing our stories. 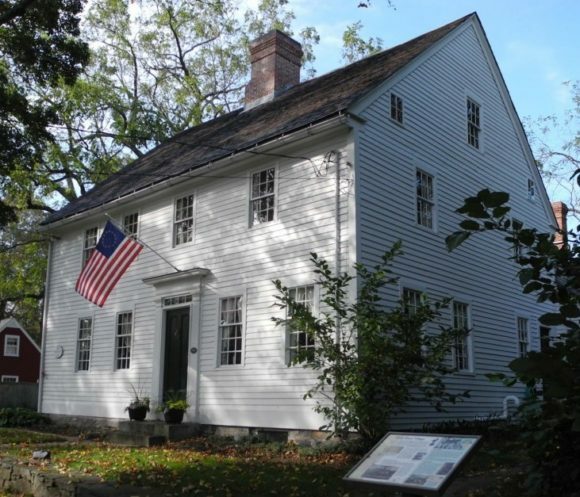 At the historic 1732 Pratt House at 19 West Ave., the town’s only historic house museum, EHS continues to improve the visitor experience, just in time for CT Open House Day, on Saturday, June 10. It will be open from 1 to 4 p.m. that day; admission is free. Admission includes the creation of a “pocket park” on the Pratt House grounds along with improved visitor amenities, outdoor lighting and signage and general beautification for a friendly, accessible visitor experience. Visitors can also enjoy Pratt House’s beautiful grounds, reproduction barn, kitchen gardens, a community garden and museum shop. See inside the Pratt House parlor on CT Open House Day, June 10. Photo courtesy of Essex Historical Society. Open to the public for guided tours on Friday, Saturday and Sunday afternoons, 1 to 4 p.m., from June through September, Pratt House is staffed entirely by trained volunteer guides or ‘docents.’ In 2017, EHS expanded its volunteer programs to recruit new guides and more are welcome. Those who volunteer their time to support our organization are its lifeblood and our investment in their support and training is critical to our ongoing success. Also that afternoon, EHS welcomes the public to the reopening of the Hills Academy History Center, 22 Prospect St., to enjoy its several improvements for visitors and researchers. Both beautiful properties serve as historic resources for the entire community, helping EHS live up to its mission of Engaging and Inspiring the Community: Essex. Ivoryton. Centerbrook. For more information, visit www.essexhistory.org or 860-767-0681. The historic 1732 Pratt House welcomes visitors for Connecticut Open House Day, June 10, 2017. Courtesy of Essex Historical Society.